This article is the second in the series about buying and selling used Lego. I don’t know about you, but I can easily distinguish a 1×2 from a 1×3 at a glance, but I can’t tell the size of larger parts without counting the studs. Technic axles are even harder to tell apart at a glance since they don’t have visible studs. 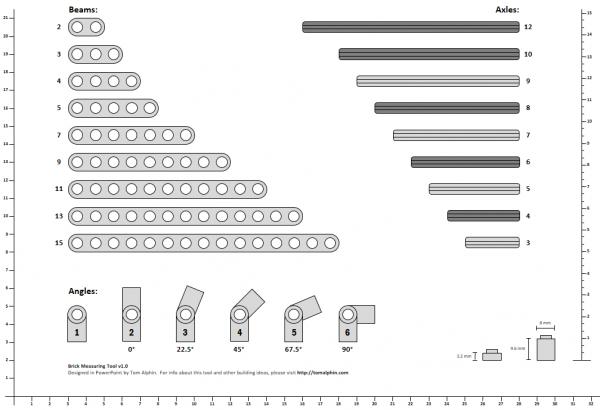 When I started sorting through my craigslist collection, I looked online to find a printable guide to help sort the various lengths of Technic Beams and Axles. I found a simple tool which I used for a while, but knew I could make something better. 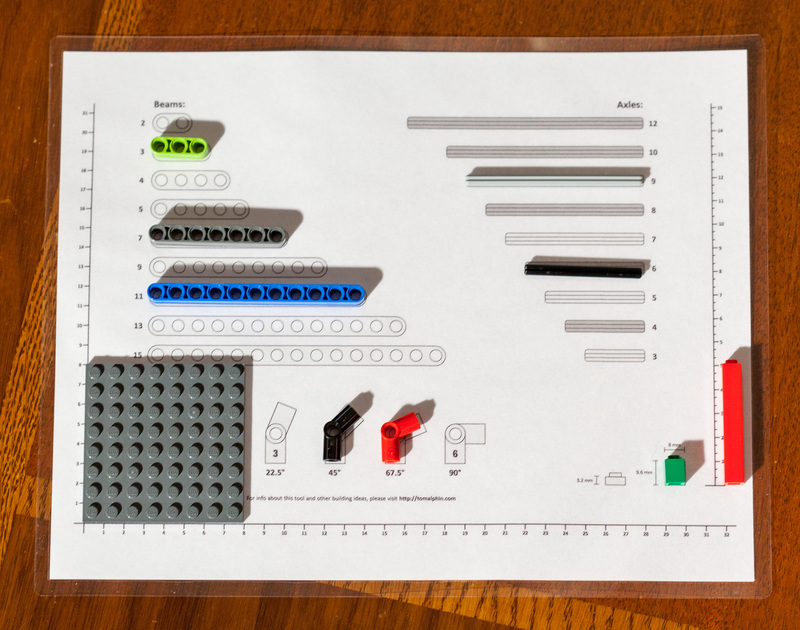 Figuring that I could improve on the design, I have created the following printable tool to help you sort your Lego bricks. It has been enhanced to show Technics angled pieces, the basic dimensions of a Lego brick, and includes two rulers along the edges of the paper. To measure a plate, align it with the lower-left corner to see its width and height. To measure the height of a part, use the ruler on the right edge of the printout. Measuring dimensions of a Plate using the included ruler. Make sure to print it at “100%” scaling factor. I designed it to fit on both an 8.5×11 inch (US) and European A4 Paper. If you have access to a laminating machine, laminate the page to make it more rigid and durable. If not, try to print it on thick paper or cardstock. I hope you find this tool helpful. Liked it? Pin this to your wall or share it with your friends. If you have ideas how to make it better, let me know by leaving a comment below! 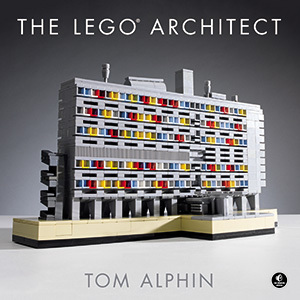 Learn how to create amazing architecture using LEGO in my bestselling book, The LEGO Architect. 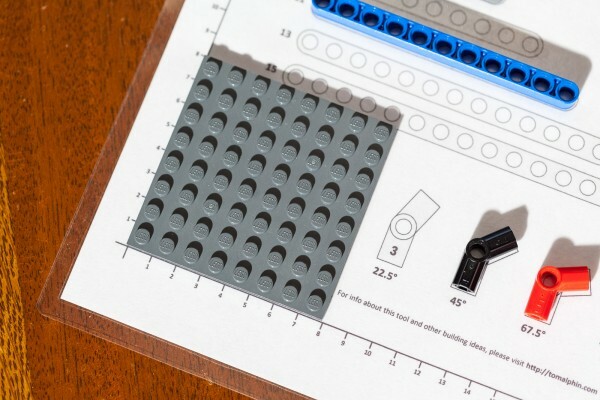 Clear instructions show you how to build the 7 most important architectural styles using common LEGO bricks, and photos of amazing LEGO Architecture will inspire you. Previous story Make lots of money by buying and reselling used LEGO! Make lots of money by buying and reselling used LEGO! Tom, do you have a vector graphic format of this available? I’d like to use it with my laser engraver to make a slightly more sturdy version… and maybe something with enough depth that I can drop the Technic axles into a slot to measure. Ian – take a look at this ruler. It has slots for Technic axles and works beautifully with all Lego. It’s made by Lego but very hard to find. I have a few of them and use them all the time. Ian, a PDF file is a vector graphic file, just try to open it in Illustrator. ok so my son has over 10k in Legos. I live in Kc and can’t seem to find anyone to buy incomplete sets. Would anyone know where to sell? Or should I start sorting? Do you take sets Apart? I don’t have some books to go with sets. Help!!! You can sell anything on bricklink.com. It allows you to state whether it is new or used, and what is missing (such as the instructions, box, stickers and so on). Thank you so much for this chart!!!! My husband and I have been looking everywhere for one of these. You have done a wonderful job on it and we are so appreciative of your time and effort in making this chart. Thank you again!!!!! May your god loves you and the people you care for! Thanks! This graph also helps me organize the beams and axles. Mindstorms is cool, but there is no ruler in the box. Axel, Glad to hear that the ruler is helpful. I have two copies in the house, both laminated. One is upstairs with the LEGO collection, and another is in the office by the computer! You are freaking awesome, Tom!! Thank you! Any tips on wheels and rims? Thanks! This is SO useful, thank you so much!